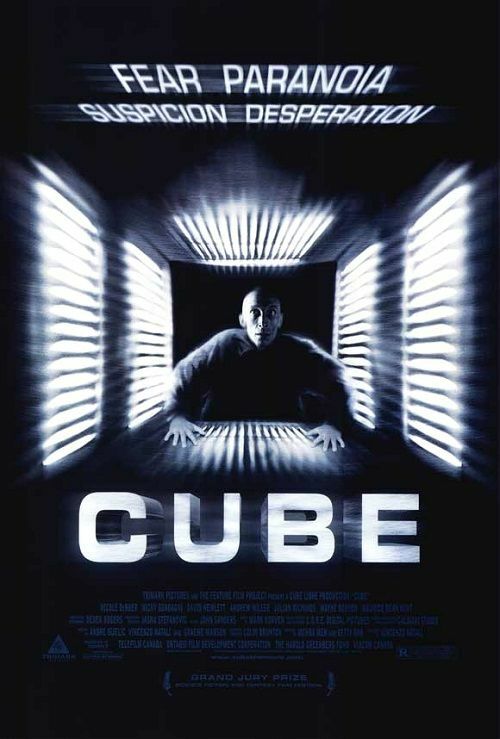 A man named Alderson awakens in a cube-shaped room with a hatch in each wall, the ceiling and the floor, each of which leads to other cube-shaped rooms, identical except for their color. He enters an orange room and, without warning, is cut to pieces by a wire grid that swings down from the ceiling. In another such room, five people – Quentin, Worth, Holloway, Rennes, and Leaven – meet. None of them knows where they are or how they got there. Quentin informs the others that some rooms contain traps, which he learned by nearly being killed by one. Rennes assumes each trap is triggered by a motion detector and tests each room by throwing one of his boots in first. Leaven notices numbers inscribed in the passageways between rooms. Quentin recognizes Rennes as "the Wren", an escape artist renowned for getting out of jails. After declaring one room trap-free, Rennes enters and is killed when he is sprayed with acid. The others realize that there are different kinds of detectors, and Quentin deduces that this trap was triggered by heat. Read more on Wikipedia.